Volunteers helped to collect 18 bags of rubbish from the Wildspace today. With wonderful weather and tea and cake at the end a thoroughly worthwhile and enjoyable time was had by all. Thanks to the sailing club for hosting us. 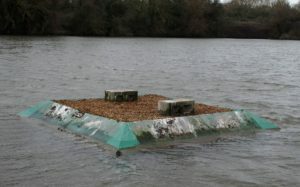 On Friday March 8th the tern rafts were cleared of the winter’s ‘guano’ and replenished the gravel, provided by the EA. The rafts have successfully fledged tern chick for the last three years and hopefully will be used again in 2019. 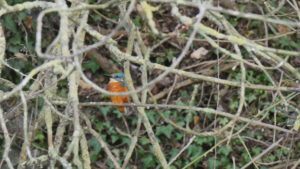 On Friday March 8th Cliff Carson visited the Wildspace to search for possible sites for kingfisher nest tunnels. 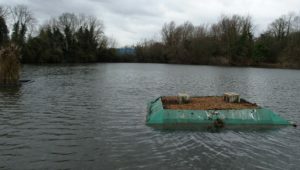 There was some promise as suitable sites were located. Unfortunately it is too late to install these for the 2019 season, but tunnels should be in place for the beginning of 2020. Ely Common was declared a Town Green in 2012 as a result of a campaign led by Ely Wildspace, securing the Common’s future as an open space, free from development, for the people of Ely and the District to enjoy in perpetuity. This status however did not ensure that Ely Common would be maintained to remain open and accessible, and over the last few years parts of the Common have been increasingly encroached upon by blackthorn scrub, despite being within Ely’s Country Park. 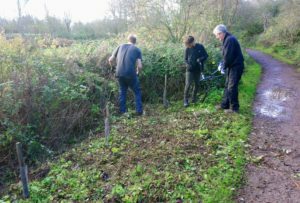 Two years ago in co-operation with East Cambridgeshire District Council Ely Wildspace began a process to clear the encroaching scrub from the Common, with the assistance of the Community Payback team and its own volunteers. 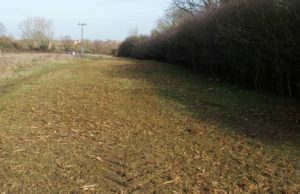 Disposing of the cut shrub and scrub regrowth has proved problematic, and the cleared areas have remained unusable. 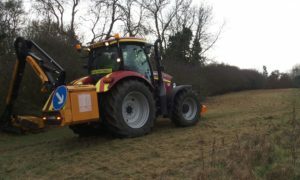 Help has come however from Camps Highways Ltd, specialists in commercial landscaping and highway soft verge maintenance, who this week provided their plant and personnel as a community service to remove and shred all the cut scrub and regrowth. The whole of this part of the Common is now accessible to the public for the first time in several years. 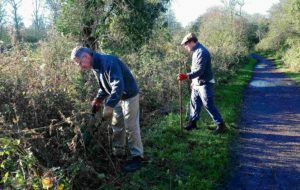 Ely Wildspace chairman Andrew Bullivant said ‘Ely Wildspace is delighted that Camps Highways’ team has come to our assistance in solving this long-standing problem of scrub encroachment on Ely Common. We hope that following their lead, ways may now be found to keep the Common open in the long term’. 9 of us turned out today to brave the sogginess and cold for the 17th Ely Bird Race. It was worth it. The species list was set at 69 for the day and includes White-fronted Goose (2) and a Jack Snipe (Springhead Meadow with 9 Common Snipe). 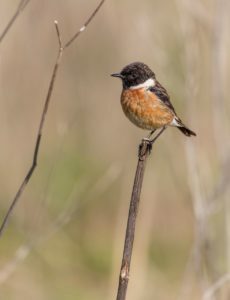 Nice to see 3 Grey Wagtails at the sewage plant (with a chiffchaff), and the pair of stonechats back on their old patch. The only notable omissions were Green Woodpecker, Little Egret and Wigeon. A later additions was a bit contentious in that we saw a flock of swans in the distance. 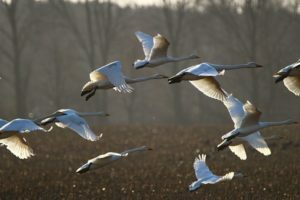 With a bit of knowledge about what was around Ben Green was confident to say that they were whoopers, but investigations into the swan movements by checking the tracking data from the collar ringed Bewicks proved fruitless. So we end with a species list of 70. Full list can be seen here. Last year (2018), the contractors for the McCarthy & Stone development on the old Peck’s site removed the hedge between the development and the public footpath on Springhead Lane. The hedge was outside the site boundary so should not have been removed. 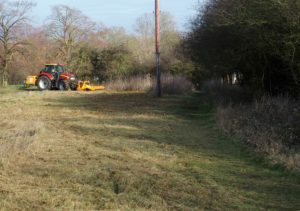 Ely Wildspace brought the hedge removal to the attention of the Senior Trees Officer at ECDC, who contacted McC & S, and asked them to replace the hedge. This they did in April 2018, but with no aftercare during the long dry summer most of the shrubs (which were hornbeams) died. The hedge was replaced again by McC & S some time in Jan 2019, again with hornbeams. 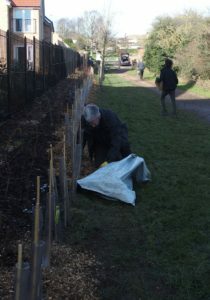 The hedge plants were donated by The Conservation Volunteers/ OVO Energy and Cambs Highways. We were extremely honoured to receive a cheque from Alayne & Susie Sallis. 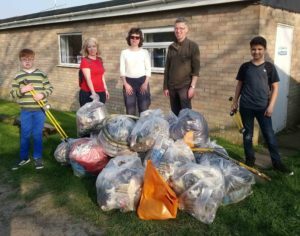 This was generously given to Ely Wildspace from donations made by family and friends in Jill’s memory. Ely Wildspace will use these monies to improve the wild space around Roswell Pits for the benefit of the birds and animals that Jill loved so much. Jill lived in the house overlooking the pits in her childhood and was married from there. She had always loved the area, the wildlife and, of course, Roswell Pits. 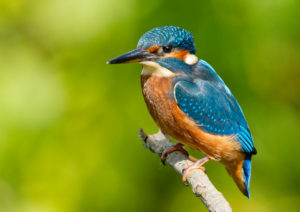 She particularly loved kingfishers and our hope is to install Kingfisher tunnels to help and encourage these beautiful birds to nest and breed. 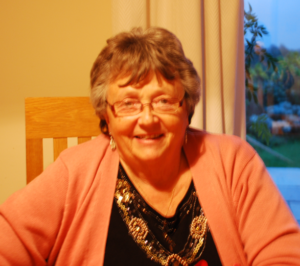 It was with great sadness that we heard of the passing of one of our most loyal members, Jill Sallis. Jill was a valued member and active supporter of Elywildspace from the beginning of our campaign in 2006. 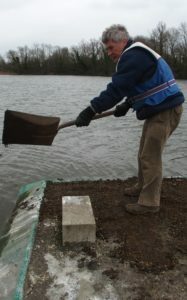 She helped the group in any way she could, facilitating many of our activities and promoting good relations with Ely Sailing Club. Jill attended our meetings, litter picks and social events whenever she was able, enjoying talking to the other members and interested in any news about the group and the Wildspace. Having had a close association with Roswell Pits since her childhood, Jill was keen to share her memories and photographs for our Oral History Project. Jill was generous and warm hearted and we offer our sincere condolences to family and friends. In early 2016 the County Council carried out a clearance operation that generated a number of complaints from the public that the character of the path had been damaged. As a result, East Cambridgeshire District Council (ECDC) met with the County Council, ECDC, Natural England, the County Wildlife Trust, adjacent landowners, and Ely Wildspace. A management regime was developed that would include County Council clearance every 3 -4 years, ongoing minor trimming of vegetation, and planting to restore the ‘green tunnel’ effect. 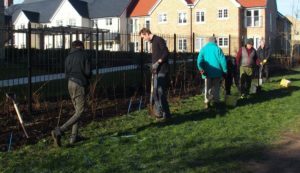 Ely Wildspace undertook to plant an oak tree, ash tree whips, hazel and field maple shrubs and transplant elm suckers in locations agreed with ECDC. This planting was completed by volunteers over the winter/spring of 2017/18. This work was followed up during the long hot summer of 2018 when volunteers cleared around the shrubs and watered them. 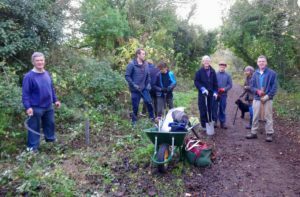 This week volunteers gathered again to plant elm whips, clear the undergrowth around the shrubs planted last season, and place new stakes and tree guards. All the plants will now have a great start next spring. Over 20 people came to help with our Autumn litter pick. It was great to see many of our regular litter pickers and also to welcome some new helpers. 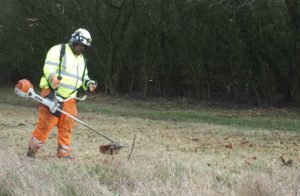 We covered a large area of the Wildspace and were reassured to find that there was less litter this time. We collected about 18 sacks, but not so many large items. Tea and cake at the Sailing Club was appreciated and we thank Ely Sailing Club for allowing us to use the club house. 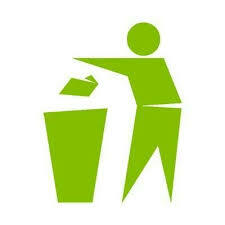 Some of our litter pickers have registered as volunteers. Once again it was an enjoyable and successful day and a good way to get involved and meet others in the local community. Many thanks to everyone who helped.